This week is another Friday's collective cooking. Collective cooking is popular in Montreal. Basically, you and your group of friends decide where to cook, then go to a supermarket and buy all the ingredients needed. Once done, cook your great dishes and eat as a group. It is fun, entertaining and money-saving. To make it more entertaining, decide on a theme like this day you can only cook Korean food or shrimp must be the main ingredient for all the dishes. Each week, my friends and I were able to invite new people for this event. Since we are still students, a large number can't cook, either eating frozen food or sandwiches everyday. It is easy to find new people to join our group. This week, I was assigned for preparing appetizer and desserts. I came across this recipe by Giada de Laurentiis. I modified some major ingredients as some don't like ham and parmesan, I susbtituted for prosciutto and mozzarela. 2. Lightly oil the muffin pan. 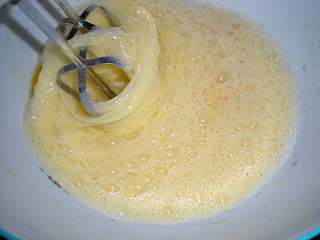 Whisk eggs, milk, pepper and salt. 4. If you use a 12-cup muffin tin, fill it half-way. Otherwise, for the 24-cup muffin pan, fill it to the top. 5. 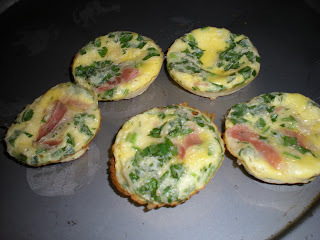 Bake until egg mix puffs, about 10 mins. Cool for 5 mins. nice and looks so delicious for sure.